What a phenomenal performance! Thanks to my friend Eri who had tickets, I managed to catch the "Drum Tao" opening performance at the Esplanade tonight. They really rocked the theatre! These world renowned drummers showcase a mesmerizing blend of martial arts, music, precision choreography, and even a dash of comedy. The drumbeats are so infectious, they had the crowd cheering and clapping along percussively. The standing ovation at the end was no surprise. I first saw them last year when they came for Ippudo TAO's opening (yes, co-branded ramen). We were treated to a private half-hour condensed spectacular, and I've been a big fan ever since. Very happy to see the TAO drummers again, especially Takuya Era, whom I feel has the best "martial grace" and prowess, the ever beguiling Arisa Nishi, and bobbing "lionhead" Morifuji. There are four shows in Singapore (1-3 Sept 2011). It was a packed audience tonight, so I hope tickets are still available at SISTIC. Seems you get 10% off if you mention inSing. 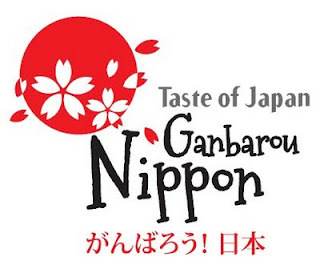 They were also giving out brochures on "Ganbarou Nippon" Taste of Japan (Facebook page) - an exhibition on Japanese cuisine and food culture, aimed at helping food businesses recover after the March 2011 disaster. The event is happening at Suntec City (open to trade on 27 to 28 Oct, 11am to 6.30pm; and to the public on 29 Oct, 11am to 9pm). Admission is free. There'll be tons of food exhibitors, food sampling, tuna-cutting demonstrations (with tastings), sake and beer tastings, business seminars featuring Yoshio Nogawa and Shigemi Kawahara, ramen-making workshops for children, and innovative food-science workshops for the young. Sounds fun. I'm registering.